Madonna says she had some explaining to do when her daughter, Lourdes, asked about that kiss with Britney Spears at the 2003 MTV Video Music Awards. "(Lourdes) is really obsessed with who is gay," says Madonna in an interview in Out magazine's April issue. "And she even asked, 'Mom, you know they say that you are gay?' And I'm, 'Oh, do they? Why?' And she says, 'Because you kissed Britney Spears.'" "And I said, 'No, it just means I kissed Britney Spears. I am the mommy pop star and she is the baby pop star. And I am kissing her to pass my energy on to her.'" Madonna, 47, famously locked lips with Spears, 24, while performing her songs "Like a Virgin" and "Hollywood" at the awards ceremony. Spears at the time admitted said she was nervous about the kiss, and about her parents' reaction to it. "Well, my mom liked it actually. I was really kind of nervous! I was like, 'Oh my God, my mom ... she's going to see this!'" Spears said in an interview on "Access Hollywood." The pop diva, considered by some to be an icon in the gay community, tells the gay culture magazine her 9-year-old daughter likes to guess who is gay: "Oh, and the other thing she likes to do when we go out, she says, 'Mom, do you want me to point out who the gay men are?' And I say, 'Okay, but I think I already know.'" Madonna also addresses her feud with Elton John, who in 2004 accused her of lip-synching. 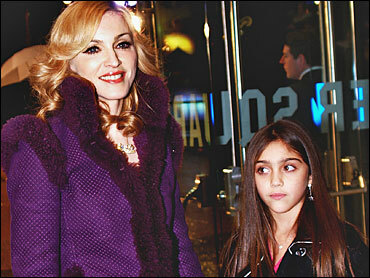 Lourdes is Madonna's daughter with actor/fitness instructor Carlos Leon. She has a 5-year-old son, Rocco, with her husband of five years, filmmaker Guy Ritchie.